The best mouse, in my opinion, is one with a weighted flywheel for scrolling. I have used Logitech’s mice with this feature for a decade. Work your way down a lengthy article or webpage and with a flick of your finger, you can zip back to the top thanks to the flywheel action. This fast, accurate scrolling becomes an addictive part of your workflow. 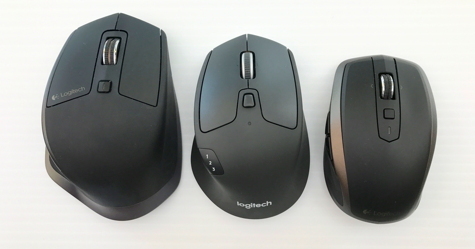 Logitech has a history of flywheel mice. I’ve owned many of them. My favorite for the past few years has been the MX Anywhere 2 Mouse. It’s smallish, portable, and can be paired with three computers. Back in the day, I had the MX Master but it was a behemoth and I found to be too large for my hand. Logitech has just introduced the M720 Triathlon and, like Goldilocks, I find the size Just Right. The Triathlon can be paired via Bluetooth with three computers. This is quickly accomplished with a button on its left side. Just behind the scroll wheel is a two position button. It changes the smooth scrolling flywheel to a click-click-click mode for use when researching complex spreadsheets and situations where little scrolling is needed such as a Keynote presentation. All of the mice I have described above, including the Triathlon, are engineered for right-handers. Logitech makes a few symmetrical mice that can be used with either hand, but their emphasis is on right-handed designs. 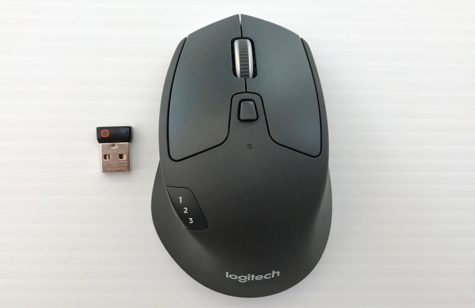 Logitech provides a small, wireless, USB Unifying Receiver that is stored inside the mouse when not in use. Plug it into your computer and you can pair up to six Logitech devices. My Logitech keyboard and mouse are always paired while occupying only a single USB socket. Logitech’s Unifying Software lets you pair and unpair devices as needed and provides status and battery levels for each. 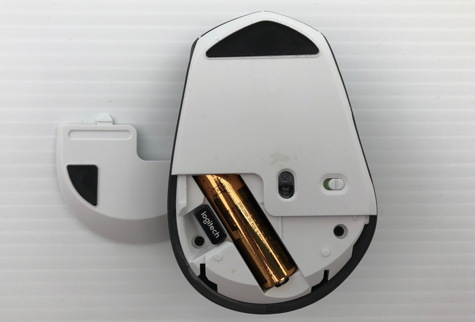 The Triathlon uses a single AA battery that will provide power for up to 24 months. I prefer this to a rechargeable battery because if you run out of power, you simply swap out the battery. No need to plug it in and wait for it to recharge. I’m a fan. This is the best mouse I’ve used and I highly recommend it. MyMac Rating is a 10 out of 10 (for those who are right-handed).